Follow these instructions from Ann Barnhardt and watch this video. Do it now. VIDEO HERE: Click on "Complete File" over on the right side of the page. This is a video of Major Heather Penney, who was one of the fighter jet pilots scrambled from Andrews AFB on September 11th. 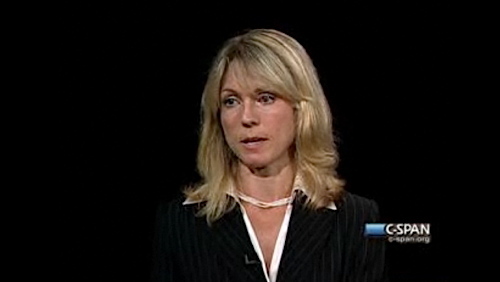 Fast forward to the 20:00 mark and listen to Maj. Penney calmly describe how she and her wingman were prepared to ram United 93 because there wasn't enough time to mount missiles onto their respective aircraft. Major Penny and the other officer who went up, unhesitatingly, to bring Flight 93 down---too suddenly to be properly armed---are higher forms of life. It's an inspiring and frightening tale. An ex-Army friend of mine once said, "A 'warrior' isn't someone who'll *kill* on behalf of a mission -- you can find people like that on every street-corner in America. A warrior is someone who'll *die* on behalf of a mission." Every American should watch this video; I was spellbound and heartened by the courage and wisdom expressed so eloquently by Major Penney during the one hour interview. She gets it as an American citizen, military member and mother! Not only should it be watched, it should be a topic of conversation with our children. Skorpion, either you've been there or you've read a bunch of Clancy. When you face it it isn't about choice, it's what you swore to do. I'd do it again but not cheerfully, only the young are that naive. Not to take anything away from Major Penny, but was that part of Clinton's "peace dividend": that we didn't have armed fighters ready to scramble to meet a threat? In this world there are beautiful women, there are strong women, there are brilliant women and there brave women. When you find a women that embodies all of those qualities and more, then you have a great women. Major Heather Penny is a great woman. Peccable: My friend was there. Also, I was raised by a Korean War combat vet (US Army, 40th Infantry) who instilled those values in me. I haven't watched the video, but maybe this will once and for all shut up the people who continually drivel on about women being unsuited to combat. There have been many instances of such evidence in the past. Google Michelle Norris for another one; briefly, got the MC for climbing out of an APC under heavy sniper fire to rescue the vehicle commander, who had already been shot. It's arguable that some combat positions are unsuitable for women, but that sure as hell isn't because they aren't brave enough. BTW, in case it isn't obvious from my nom de blog, I'm a man. This is the 1st time I have spoken publically about this. The state of readiness on 9/11 WRT air sovereignty. At that point in time there were only alert missions at the 102 FW -MAANG, 177 FW -NJANG, 119 FW -NDANG (located at Langley AFB), 125 FW -FLANG (Det at Homestead ARB), 144 FW -CAANG, and 142 FW ORANG. The 2-ship that Heather speaks of was performing a practice bomb mission at Dare County range in NC on that morning. Time was of the essence that morning and there wasn't time to land, reconfigure the aircraft for an air-to-air mission and engage the threat heading to DC. They had to meet the threat with what they had. I know this, because I was there. I stood up the Command Post at the 113th Wing -DCANG on 9/11. I am intimately familiar with Heather's story. I remember the conversation at the SOF desk and discussion on whether to ram then eject of eject just before ramming -I had to relay these details to the White House as well as other information so we didn't avoid a friendly fire incident. There is much she has said and much she cannot say as I cannot say -not state secrets of conspiracies but rather EEFIs and other minutae. Thank you for this. Put her next to the shrimp brains in the White House and they would melt in shame. Where do we get such women? CORRECTION "avoid a friendly fire incident"
PLEASE CHANGE and thank you. "Pickle-happy" is how the Left sees our armed forces. Maj. Penny's calm, strong testimony and indeed, the facts surrounding her account do not support their damnable opinion. What's she doin out of the kitchen?? ... out of the kitchen? I just bet a woman like that knows how to slow cook pulled pork on the exhaust manifold. Officer: "Are you willing to die for the Union?" Private: "No, sir. But I am ready to die, unwilling." That seems to be where Maj. Penny was on that day. As an historical note, the Luftwaffe formed a ramming squadron near the end of WW2. Not many got through the American fighter screen, but some did and some of them even survived ramming a bomber. They had to bail out manually from their crashing fighters. Maj. Penny would have had at least the advantage of having a rocket-fired ejection seat, but that's a mighty thin lifeline. I guess even female fighter pilots have a brass pair. Major Penny truly represents the best and brightest our society has to offer. Even the miscreants that villify anything resembling armed forces have to acknowledge the Major's profound sense of duty; and with just a little effort - would see that this is the embodiment of the entire military. This video should be required viewing in all US high schools. Bravo! Greg, thank you very much for your service. For the record, the major's last name is spelled Penney. People like the good Major are willing to do what it takes to protect America. The rest of us seem too busy watching TV and tweeting to resist a takeover by the Marxists. Most Americans are willing to do anything to defend America but turn off the TV or read a book. How many people do you know that haven't bothered to research Islam since Sept 11? How many people do you know that take great pride in being "moderate" or independent" as between liberty and statist socialism? If all it takes to give a few whiners a life of slothful indulgence is to burn the society to the ground, get the matches. Oh, and nuke the eff out of Pakistan and Iran while it will do some good. There will be a nuclear war with Islam, they say that is their goal and they are working toward it. If you are in denial because it's a terrible thought to contemplate all you are doing is making sure they get in the first shot. This isn't Mayberry and the world doesn't care that you desperately wish it was Mayberry. The bad people depend on your denial of the obvious, don't give them aid and comfort in the vain hope the savages that seek our destruction will change their minds. Our heroes are willing to give their lives to protect you. Have the decency to not demand our heroes die just because you believe in unicorns. If you want the definitive story of what happened in the air on Sept 11 I beg you to read "Touching History" by Lynn Spencer. Not only will you find out the back story behind so many of the confused reports of possible hijackings of other airliners that day, near Cleveland and Alaska and Hawaii, but you'll understand how and why the military response, while brave, was muddled. The leaders failed us, but the individuals rose to the occasion. None of the aircraft had live missiles to fire at airliners. The conspiracy kooks watch too many movies and believe in an all-powerful, all-competent military located near all locations. The "other officer," her commanding officer, was Col. Marc Sasseville. Now repeat all that praise for him.